It looks like an antique picture! Love the colors! Peonies are such a beautiful, old fashioned flower. Love them! Love this! and the reflection from the bottle is what captured my eye as well...rest well. Get some rest. we'll wait for our field trip. This simple flower is a pleasant surprise. i owe you one. i opened your blog, it's 8:30 a.m., and i remembered i have to go water my garden. right now. thank goodness it's a short post. 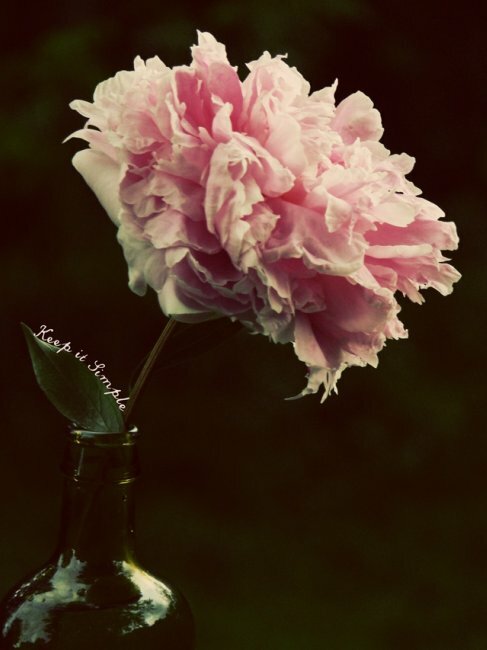 I heart peonies!!! Great picture! So pretty! I love peonies, I wish I had some growing here. Maybe next year! I've got to clear out a spot for them first I guess! Thanks for sharing some beauty! Peonies are my absolute favorite! Gorgeous shot. Have a great weekend you toooooo! Peonies are my favorite. Especially big white ones! Thanks for sharing the beauty! I really need to plant some peonies! They are just so gorgeous! They are beautiful! The picture does look antique. I didn't even know peonies were fragrant... Happy Weekend too! waiting for my peony to bloom, looks like at least two more weeks. that's a beauty,.. enjoy! the peony's and iris have been extra large and beautiful here--just magnificent. Here’s my photo story happy Friday!